New research disputes the benefits of omega-3s for moms and babies. Our experts weigh in. Omega-3 fish oils, particularly DHA, are touted as an important nutrient for pregnant women because of their role in fetal brain and eye development and in helping to prevent postpartum depression (PPD) in new mothers. Yet a recent randomized controlled trial—considered the "gold standard" of medical research—found that the children of women who took fish oil supplements during pregnancy had no better cognitive or language skills at 18 months than the children of women who took a vegetable oil placebo. Nor did DHA protect women from PPD, the study published in the Journal of the American Medical Association (JAMA) found. 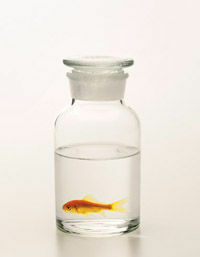 But before you toss your fish oil supplements, experts caution that one study by no means tells the whole story. Several previous studies have shown DHA to be important to a baby's cognitive development. For example, a 2003 Norwegian study found that at age 4, children of women who took cod liver oil (which contains high levels of DHA) during pregnancy had higher IQs than children of mothers who were given a corn oil placebo. It's for those reasons that organizations such as the March of Dimes recommend that pregnant and lactating women get the equivalent of least 200 milligrams of DHA daily. In the JAMA study, pregnant women took 800 milligrams daily; rather than suggest DHA isn't important, the research may show that extra-high doses don't provide added benefits, says Janis Biermann, senior vice president of education and health promotion for the March of Dimes. What's more, other research suggests that a DHA deficiency can cause big problems. For example, animal studies have found that the offspring of mothers deprived of DHA during pregnancy have vision and behavioral problems; others have found that human mothers similarly deprived have an increased PPD risk. This is a crucial distinction: DHA deficiency is common in the American diet, and pregnant women consume an average of only 73 milligrams daily. Stock up on the essential supplements you need to reach your diet and fitness goals at GNC Live Well. How to get DHA in your diet The best sources of DHA are oily, cold- water, low-mercury fish such as salmon, sardines, trout and herring, as well as shellfish like shrimp and crab. Eating about two servings per week, or 12 ounces total, will give you what you need. Canned light tuna has been considered safe, but Consumers Union is now suggesting that pregnant women stay away from it, too (see below). A few other foods with some DHA are nuts, soybeans and flax seed. Many prenatal vitamins and most brands of infant formula now include DHA, and milk, bread, eggs, yogurt and soymilk are also increasingly being fortified with it. Another option is a fish oil supplement. However, it may be better to get omega-3s from seafood because they contain other nutrients such as selenium, vitamin D and iodine. If you're a vegetarian or vegan, algae- based supplements are an option (fish get their omega-3s from algae). Neonatalogist Jatinder Bhatia, M.D., chairman of the American Academy of Pediatrics nutrition committee, says he will continue to recommend that pregnant and breastfeeding women get enough DHA, either by eating seafood or taking supplements. Premature babies should also be given supplemental DHA. "The naysayers can say we haven't shown a clear benefit," Bhatia says, "but no study has ever shown harm." Are supplements safe? As with anything you take when pregnant, you need to be careful. The March of Dimes' Janis Biermann suggests looking for fish oil brands with U.S. Pharmacopeia's "USP Verified" seal, a voluntary certification that shows a product is free from contaminants such as mercury and contains the potency described on the label (see a list at www.usp.org/USP Verified/dietarySupplements). But even without the stamp, there is little to worry about: Most products sold by major manufacturers are highly purified. Indeed, a 2003 Consumer Reports test of 16 top-selling brands found that all contained the amount of DHA promised on the label and none had significant amounts of mercury or other toxins. Ta-ta, tuna? Maybe you shouldn't order that tuna salad sandwich after all. According to tests on 42 samples by Consumers Union (CU), publisher of Consumer Reports, the amount of mercury in canned tuna varies widely. While the average mercury level wasn't dangerous, CU advises pregnant women to avoid canned tuna altogether rather than risk exposing the fetus to a "spiked" serving. Mercury, a neurotoxin that can affect fetal development when consumed at high levels, builds up in fatty fish, especially those higher on the food chain, including tuna. The healthful omega-3 fatty acids can be found in safer forms of seafood, including shrimp, wild-caught salmon, tilapia and sole.